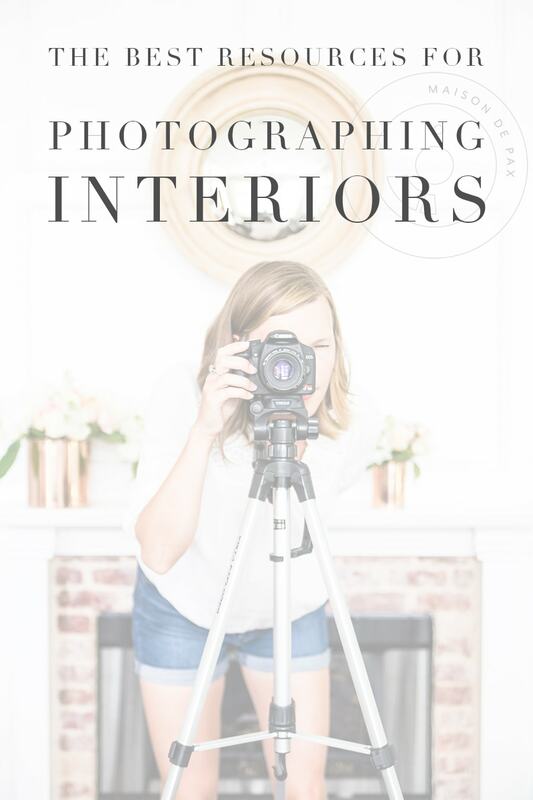 Are you a blogger, interior designer, real estate agent, homeowner, or small business owner looking to take beautiful interior photos? 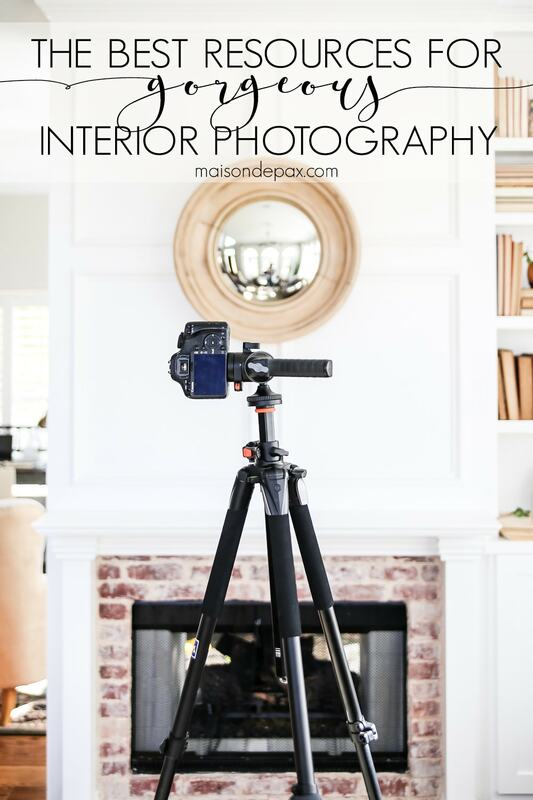 These photography resources will help you take the best home photos you can. As I said on my blogging resources page, blogging (at least in the general categories that I assume you are interested in if you are coming to Maison de Pax for suggestions! ), is at least 50% photography. Maybe more. I get questions all the time about my camera equipment and photography strategies, so I wanted to put them all together for you. When you subscribe to my photography newsletter (which is absolutely FREE! ), you also receive my two favorite Lightroom presets as a free gift. 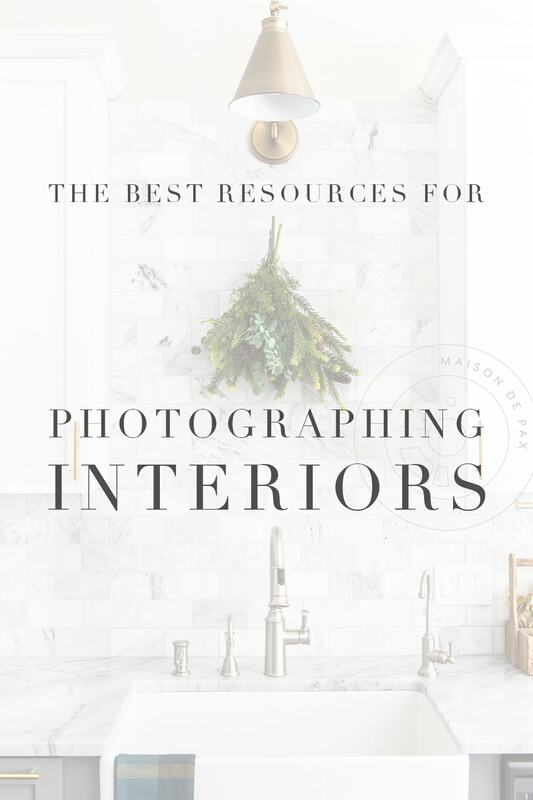 Save yourself time and create incredible images with these free presets for interiors! See the presets in action here or just sign up below! and I continue to receive messages almost weekly from new readers who have found it and loved it. It’s totally FREE, and it walks you through my equipment and processes at the time. To be honest, I’ve since upgraded my equipment (see below for details) and tweaked things a bit (I now do almost all my editing in Lightroom, for example, rather than a combo of Lightroom and Photoshop which I did at the time of writing that series), but most of my basic processes are the same. Feel free to start with this series for photography help! I also have created a full photography course: 10 hours of instructional video content, a 100+ page workbook, and specific challenges to help you build and master your skills. 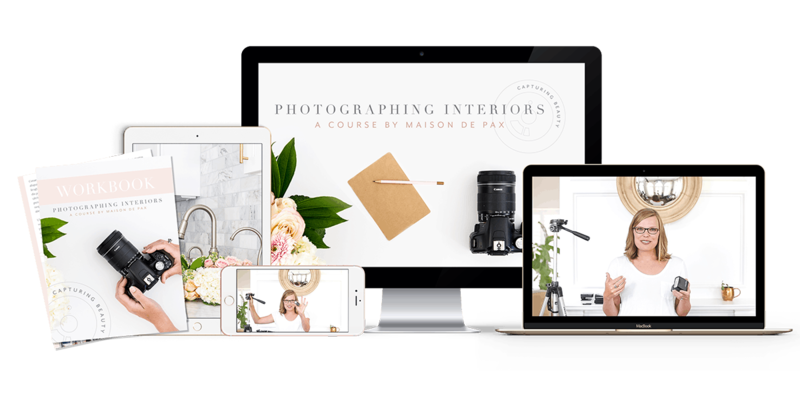 The course focuses specifically on photographing interiors, but it also includes special bonus units of photographing outside scenes, holiday lights, flatlays, and more. You can read more about it and/or purchase the course here. If you are just starting out and are looking for a more affordable set of camera equipment, these are the camera, lenses, and tripod that I would recommend. They are pretty much the ones I used for years… I won’t lie. I saw a huge improvement in my photography when I upgraded, but given that ~50% of the photos you’ve seen on my site were taken with this equipment, I’d like to think that it served me pretty well. Again, go read my photography series if you’d like to get a better idea of what you can accomplish with this equipment. One little note: another budget option is obviously to get the camera that comes as a “kit” with lenses… but I can’t say I recommend it. If it’s all you can afford, definitely start there, but truly spending a bit more on quality lenses can make a world of difference in your image quality. Also, don’t be afraid to look for used or refurbished camera bodies. They have a risk, obviously, but I’ve had plenty of friends who have had great success that way! You’ll notice that the two lenses I recommend in my “beginner” and current equipment are the same. There’s a reason for that: when you are ready to spend the extra $800-1000 on a new camera body, you’ll want lenses that still work! The biggest jump you can make (both cost-wise and photo quality-wise, in my opinion) is to get a “full frame” camera. That just means that when you look through a 6D window, the room is in the same proportions as what you see with the naked eye. This allows you to shoot full room or close up shots with less lens distortion. The Rebel, a DSLR beginner camera (or the Nikon equivalent), actually zooms the shot in 1.5x… it makes it tough to get true, square images of a room. Another note on tripods: ultimately, what you need is something that will safely hold your camera still so that you can take an image with a longer shutter speed and not have any camera shake. TRUST ME, I think this is the number 1 tip I can give you for quality images. Does this super inexpensive tripod accomplish that? Yes. Start here if funds are low. However, the more expensive tripod has several aspects that make it worth it to me at this point in my photography: it is sturdier (which is great when my kids run through the room where I am photographing), it goes quite a bit higher (which is awesome for some odd angles), the pistol grip makes adjustments a snap, and it has an arm that goes horizontal for those fun flat-lay images. Reflector/filter – perfect for adding a little light to a dark corner or softening the light coming through a window. Canon Speedlight – a pricier accessory investment, but this off-camera flash has helped tremendously with photographing bathrooms and closets with very little to no natural light. Transmitter – some cameras will not communicate automatically with the speedlight above; if so, you’ll need this transmitter. Close-up filters – I also have enjoyed using these little lens filters for close up shots – seriously, less than $15 is hard to beat! And just for fun, my camera bag sometimes makes it into my shots (because I think it’s pretty 😉 ). It’s a bit of a splurge for a bag, but it was a gift and I love it. The Adobe Creative Cloud is like pure gold. I had an old version of Photoshop on my computer from my teaching days, but when that computer bit the dust, I quickly signed up for the creative cloud. For ~$10/month, you can use the latest versions of Photoshop AND Lightroom. I do pretty much all of my image editing in Lightroom, but I love to use Photoshop for graphic and text overlays. 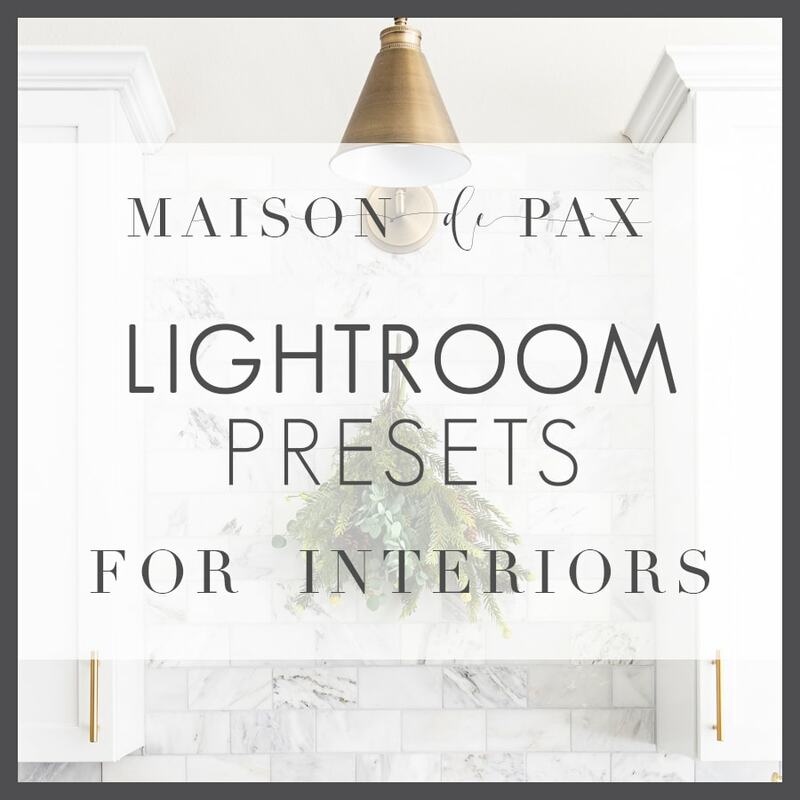 Don’t forget, if you use Lightroom, you can use my free presets for bright, crisp interiors! Let me know if you have any questions! To see my other blogging resources, visit here. And be sure to pin this for future reference as I am always adding and improving on this list!